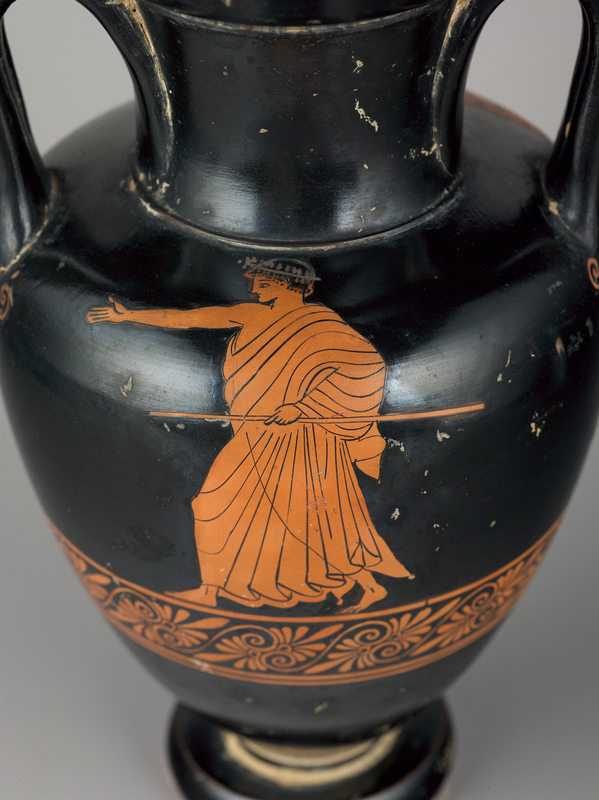 The Museum’s fine collection of ancient Greek vases recently welcomed an addition notable for its beauty, condition, and pedigree. Made in Athens in about 480–475 B.C., it is a painted ceramic vessel known as a Nolan amphora, after the Italian town of Nola, where many imported examples were discovered in the nineteenth century. The vase is decorated in the red-figure technique, in which the figures and ornament are reserved in the red clay of the vessel, and the background is coated with a fine clay slip that fires black in the kiln. The tall neck and slender tapering body are typical of Nolan amphorae, as is the distinctive decorative scheme, with the unframed figures “spotlighted” against a lustrous black ground. The type was popularized in the early fifth century B.C. by an anonymous Athenian craftsman known to scholars as the Berlin Painter, and this vase was certainly painted by one of his more talented followers. A single figure occupies either side of the vase, above a continuous ground line consisting of a band of slanted palmettes. Below each handle is a pendant palmette, also in red-figure. 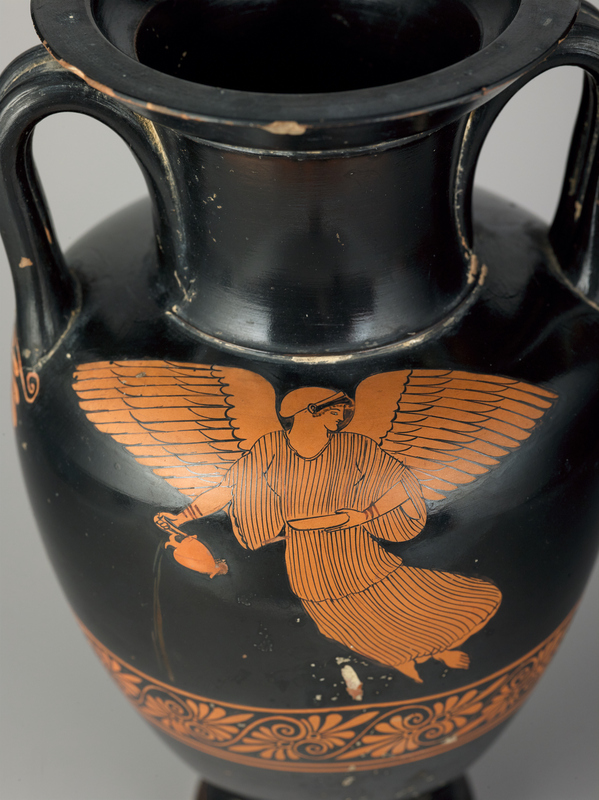 On one side, Nike, the goddess of victory, flies to the left but looks back to the right, her face in profile. Her wings extend to either side so that a single figure fills a space that might otherwise have been occupied by two. The goddess wears a belted ankle-length gown with a deep over-fold. Her dainty feet, one cunningly foreshortened, emerge at the bottom. The voluminous sleeves of Nike’s gown hang below her elbows, and her breasts—also flaring to either side—are clearly discernable behind a veil of pleated linen. Her hair is largely concealed by a cloth bag, a sakkos, and on either wrist she wears spiral bracelets. In her left hand she holds a shallow dish, a phiale, and with her right hand she pours a libation of red wine from a jug. The figure of Nike is entirely contoured with relief lines, like those used for the drapery folds and other internal details. These raised contour lines, which enclose nearly every element of the decoration, make the figures “pop” against the black ground. They sharply define Nike’s straight nose, full lips, and prominent chin, while the wispy hair on her forehead is, instead, loosely brushed with diluted slip. On the reverse of the vase, a beardless youth is shown running to the left while clutching his walking stick. He is dressed in a woolen cloak and has a red wreath in his hair. He extends his right arm before him, as though hailing someone. We might imagine that he is a victorious athlete or musician who is rushing toward the goddess on the other side, but this is unlikely; instead of proffering a victor’s wreath, Nike flies away from the young man.